Thyroid Adrenal Reset Complex is Dr. Westin Childs’ 100% all natural formula designed to support adrenal and thyroid function in people with thyroid disorders. This supplement has been battle tested on hundreds of thyroid patients before you to help them regain their energy and improve thyroid hormone status. 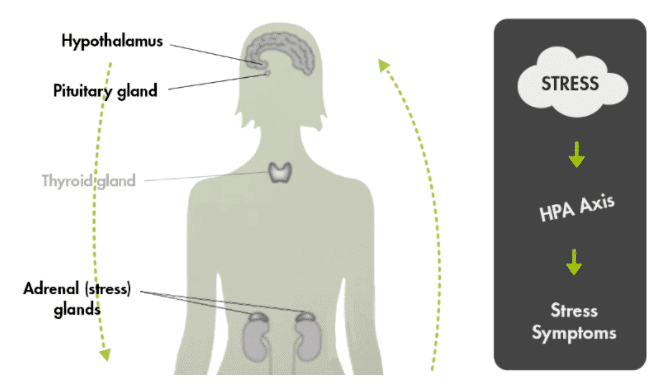 What is the Thyroid Adrenal Reset complex? Thyroid Adrenal Reset Complex is made of the 18 of the best high-quality ingredients in their most bio-available form all 100% natural and backed by science. It is a supplement specifically designed to help improve adrenal function which will then directly impact thyroid function. Both of these systems are intricately linked to one another. Studies have shown that as cortisol levels become dysregulated so does your TSH. Through the direct influence of cortisol. And through cortisol influence on thyroid hormone. This supplement contains special ingredients which naturally help to improve and regulate cortisol levels while supporting adrenal function through adrenal glandulars (bovine sourced). In addition, this complex also includes several key nutrients required for proper cortisol production – yet another way that this supplement helps nourish adrenal function. This supplement was designed with hypothyroid patients in mind. Because this patient population has specific needs and not all supplements are created equal. I have successfully used this product on thousands (and counting) of hypothyroid patients. Who should use this thyroid adrenal reset complex? Because of the potency of this supplement I recommend that you do not take it afternoon each day. It can keep certain people awake. Rhodiola – Rhodiola is a powerful adrenal adaptogen which means that it supports cortisol levels and cortisol receptor sensitivity in the body. Several scientific studies have shown that it is helpful in improving mood, reducing your stress response and improving your resilience. Adrenal Gland – Adrenal gland serves as one of the most powerful ways to naturally support cortisol levels in the body. Taking adrenal glandulars is very helpful for patients with adrenal fatigue and suboptimal serum cortisol levels. Adrenal glandulars work synergistically with adrenal adaptogens like Rhodiola. L-Tyrosine – L-Tyrosine is required for proper thyroid hormone production in your body. It serves as a precursor, which when combined with iodine, helps create thyroid hormone. Using L-tyrosine can improve thyroid status in the body if you have deficient levels. Zinc – Zinc is a trace element but acts as a powerful anti-inflammatory agent in the body. Zinc also naturally helps to boost T4 to T3 conversion. Taking zinc (in the correct form) will help improve thyroid conversion and thyroid status in the body and compliments other adrenal boosting effects listed above. Vitamin C – Your adrenals secrete Vitamin C in states of high stress secondary to the effects of ACTH. Replacing and supporting your body with Vitamin C is helpful for patients with a consistent and high amount of stress. Vitamin C is also a powerful anti-inflammatory agent. B Vitamin Complex (B2, B3, B5, B6) – B complex vitamins are required for proper adrenal function. Due to poor nutrition, high stress and MTHFR defects many patients are deficient in 1 or more of these B vitamins. This means that under intense stress your adrenal function may be impaired due to these deficiencies. Taking B Vitamins help provide adrenal hormone precursors in the body and may also improve mitochondrial function and energy production. Lemon Bioflavinoid complex – Lemon bioflavinoid is a powerful anti-inflammatory agent which can help improve thyroid conversion by reducing inflammatory pathways in the body. Grade Extract – Grape extract has been shown to reduce HOMA-IR, improve lipid profile and reduce insulin resistance. Parotid, Thymus, Spleen Gland & Extract – Studies have shown that certain glandulars can improve immune status and inflammatory pathways in the body. Chlorella – Chlorella helps to naturally improve liver function and elimination pathways in the body. Proper absorption is required for these nutrients and it’s a big deal for thyroid patients who present with low stomach acid and other GI issues. To combat this all of the nutrients in this complex come in the most highly absorbable formulation. 1.) Is this the Right Supplement for me? 2.) How do you take it? For mild to moderate adrenal fatigue, I recommend that you take 2 capsules each morning (with a meal). For advanced adrenal fatigue you may need to take 2 capsules in the morning and 2 capsules at noon (for a total of 4 capsules each day). Taking this supplement with food will help reduce any issues with nausea. Do not take this supplement afternoon or it may make sleep difficult. 3.) Can I take this with Thyroid Medication or other Supplements? Yes! 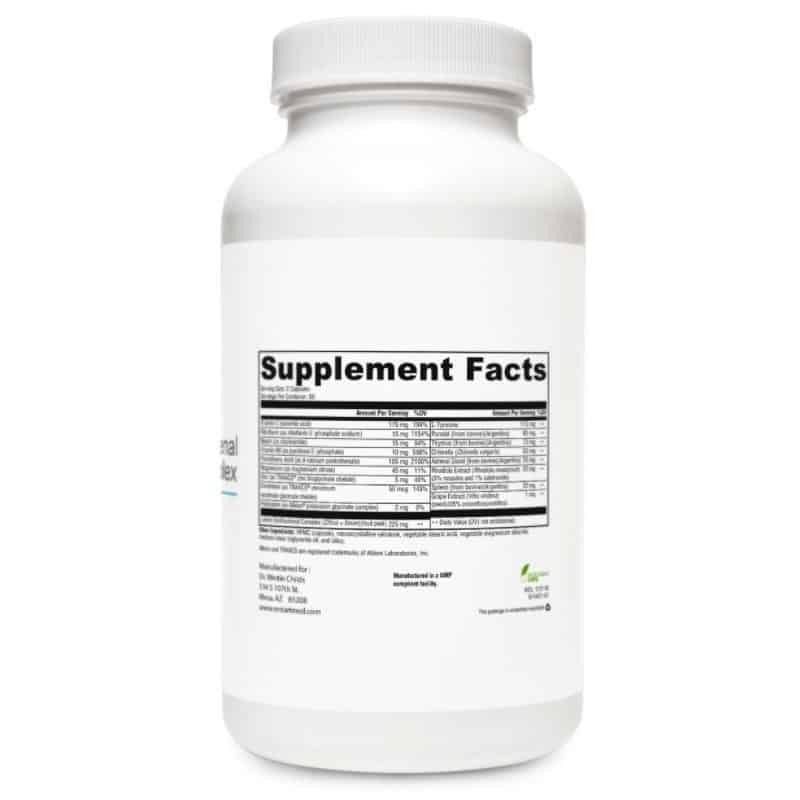 All of our supplements (including this one) are designed to be taken with all types of thyroid medication. This includes T4 medications, T3 medication, and T4 + T3 combination medications. All of our supplements are designed to be safely taken with one another as well and tend to work better when combined. 4.) How long do I need to take it? For mild to moderate adrenal fatigue, you will need to take this supplement for 4-6 months. For advanced adrenal fatigue, you will need to take this supplement for 6-12 months depending on the severity of your symptoms. Most people notice an improvement in their symptoms within 4 weeks but it may take up to 8 weeks for you to notice a difference! As you continue to use the supplement you should continue to improve. 5.) Are there any side effects? No, most side effects are positive. Meaning you will experience an increase in energy levels. Some people do experience some mild nausea if they take the supplement in the morning on an empty stomach but this can be resolved by taking it with meals. 6.) Can I use this with Hashimoto’s thyroiditis? Yes, this supplement can be safely used if you have Hashimoto’s thyroiditis, regular hypothyroidism or if you have no thyroid (post-thyroidectomy patients or post radioactive iodine ablation patients). 7.) What if I don’t have thyroid issues? This supplement and nutrient blend will help improve adrenal status in both thyroid and non-thyroid patients. The nutrient complex contains special ingredients which are beneficial for inflammatory states and hormone imbalance states. 8.) How long will it take my adrenals to heal? This largely depends on how aggressive you are with supplementation, lifestyle changes, removal of stressors from your life, etc. On average most adrenals will take at least 6 months to heal (even for mild to moderate cases). Some patients will need longer than 12 months (for advanced cases). 9.) Can both men and women use this supplement? Yes, this supplement is safe and effective for both males and females. 10.) Can I use this with other supplements? 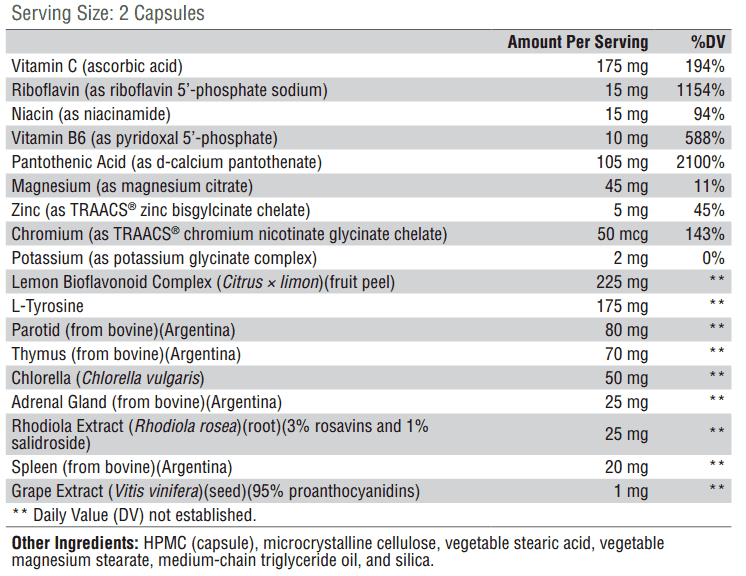 Yes, this supplement can be combined with other supplements. It is especially helpful when combined with Dr. Childs’ other thyroid nutrients and supplements. 11.) Does this product contain animal products? Yes, the glandular products (Bovine, Spleen, Parotid, Thymus and Adrenal Gland) are bovine sourced. This is not a vegan supplement. 12.) Does this product have inactive ingredients? 13.) How does shipping work? 14.) What is your Return/Refund Policy? 15.) What if I have other questions? Consult your healthcare practitioner prior to use. Individuals taking medication should discuss potential interactions with their healthcare practitioner. Do not use if tamper seal is damaged. The labeling on this product does not comply with California’s Proposition 65. There, this product may not be sold in California. Keep closed in a cool, dry place out of reach of children. Side effects are rare but may include: dizziness, abdominal changes, upset stomach, heartburn, heart palpitations, nausea, jittery sensation, anxiety & diarrhea. Before Dr. Childs formulates any product he turns to the research to determine the best quality nutrients to include. Dr. Childs then tests these supplements on himself and patients to determine that they do indeed work. The result is amazing products that actually do what we say they do. Many supplement companies and brands put together low dose supplements and string them together without testing or researching their products to ensure that they work. This results in poor quality supplements that don’t offer benefit to patients. I’m starting to feel better. I don’t feel great, but I feel better than before I started taking Dr. Child’s supplements. I’ve been taking them for about three months. Not knowing if I really have thyroid issues but know that I have screwed up my hormones by eating only low carb for SO many years, I have been seeing some weight loss results (doing the fasting diet). I think that it is working but it will take some time. With any changes in our diet and lifestyle, it is important to evaluate all aspects and not give up hope. I will continue for a couple more months and give a more insightful review. I purchased for my daughter. She has been taking them and along with her synthroid. She said after about two weeks of using them she does feel a little better. I have not seen any results so I am not sure I should reorder. Feel better and seeing results.